Greetings, and welcome once again to another Recipe of the Month post! This month, we will be looking at the Belgian Pale Ale style, a simple, sessionable beer style that is lower in hops and higher in fruity flavors than its English and American counterparts. This is the perfect beer to enjoy during these last few days of summer as we transition over into fall! There are a host of commercially-available examples of Belgian Pale Ale available both from Belgian breweries and breweries right here in the states. Many of these are a bit higher in alcohol than is called for in BJCP (Beer Judge Certification Program) guidelines, but are still considered as classic examples of the style and are thoroughly enjoyed worldwide, such as Orval Trappist Ale and Ommegang BPA (Belgian-style Pale Ale). These two both come out at slightly high on the ABV scale (6.2% or so) but are wonderful beers. Russian River makes their Redemption ale a bit more sessionable and along the traditional line of potency at 5.15%. As already mentioned, Belgian Pale Ales are light ales that are traditionally not as hoppy as they are in England or the United States. Rather, they have a bit more malt character with a hint of sweetness and toast, combined with a fruitiness and spice character that comes from the Belgian yeast. While many brewers may be tempted to up this fruit and spice character with the addition of actual fruit and/or spice, it is easy to take this to an extreme; the style is known to be well-balanced overall. The character emanating from the yeast itself under controlled temperatures should be enough, although this could make a great light base for a spiced or fruit beer! For this recipe, we will use Belgian specialty malts to get that slight sweetness and toasted character, namely Caravienne and aromatic, respectively. Caravienne is a Belgian crystal malt that can give us that touch of residual sweetness, with aromatic lending a slightly bready, toasted note. While some recipes use Belgian Pilsner malt, Belgian pale malt can be used as well, and it is the way we will go with this recipe, as this will mean a normal boil time (as opposed to an extended 90+ minute boil used with Pilsner malt to eliminate precursors to DMS). The pale malt will also give us a slightly deeper color and help us get close to the typical color range for this style (8 to 14 SRM). 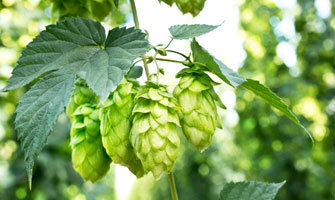 As far as hops go, noble hops and English hops are often used. While aged hops can and have been used in these recipes, we will simply stick with regular pellet hops. We want enjoy this soon-ish, after all! Our recipe calls for an ounce of EKG for bittering, then a half ounce each of Styrian Golding hops at 15 minutes and flameout, respectively. A Belgian strain should be used for fermentation to get the fruit character and slight spiciness we are looking for. Personally, I am a fan of Wyeast 3522 Ardennes, as I like the light apricot flavor that it gives to beers. Imperial Organic Yeast’s Gnome strain is another wonderful and similar choice. For dry yeasts, Safbrew T-58 works well. Ready to give it a try? Here we go! 1.0 oz. East Kent Golding hops (5.7% AA), added at the beginning of the 60 minute boil. 0.5 oz. Styrian Golding hops added with 15 minutes left in the boil. 0.5 oz. Styrian Golding hops added at flameout. 2 packs (or make an appropriate starter) of Wyeast 3522 Belgian Ardennes, or 1-2 packs of dry Safbrew T-58 yeast. You might also use 1 can of Imperial Organic Yeast B45 Gnome Yeast. As a Belgian pale ale, feel free to experiment with your favorite Belgian ale strain! Mash at 152F for 60 minutes. A mash-out at 168-170F for 15 minutes is recommended, but not necessary. 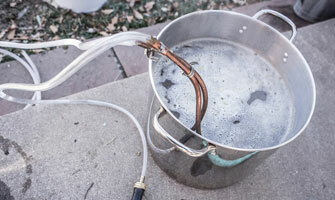 Drain, sparge, and proceed with a 60 minute boil. Chill to 64-66F and pitch yeast. Ferment at 66F for two to three weeks before bottling or kegging. A secondary fermentation for one week to improve clarity and reduce sedimentation is optional. Extract Version: Replace the 10 lbs of Dingeman’s pale malt with 6 lbs of light dry malt extract . Steep the specialty grains (Caravienne and Aromatic) at 150-155F for 30 minutes using a muslin grain bag, working the grains well with a spoon to make sure they are fully hydrated. Remove the bag, allowing the grains to drain into the boil kettle. Turn off the flame and dissolve the extract in the kettle. Turn the flame back on, bring to a boil and proceed as above. NOTE: as the extract version is slightly different than the all-grain, you may have a slightly higher gravity post-fermentation.